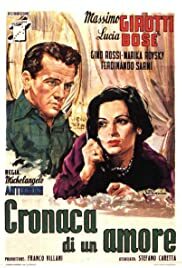 In Milano, when the wealthy and jealous entrepreneur Enrico Fontana (Ferdinando Sarmi) discovers hidden photos of his gorgeous twenty-seven year-old wife Paola Molon Fontana (Lucia Bosé), he hires a Neapolitan detective agency to investigate her past. Enrico, who owns twenty companies, married Paola during the war in March 1943 and her past is unknown to him. Detective Morale Carloni (Gino Rossi) is assigned by his boss to head to Ferrara, where Paola studied the technical school after leaving her hometown in Rovigo. During his investigation, the snoopy Carloni discovers that the teenager Paola dated many youngsters and her best friends were Matilda Calvani and Giovanna Carlini, who died seven years ago two days before her wedding with Guido (Massimo Girotti). He gets the address of Guido with Matilda's father but his wife sends a letter to Guido advising that the police was probing him. Guido travels to Milano, where he meets Paola after seven years to show the letter. When they see each other, their old passion reignites; but Carloni is still chasing the truth about the tragic accident with Giovanna. "Cronaca di un Amore" is the first feature of the director Michelangelo Antonioni and his debut could not be better. This film noir has a magnificent cinematography in black and white and unusual and sophisticated angles of camera. The story is engaging, with the gorgeous nineteen year-old Lucia Bosé, who was Miss Italy 1947, in the role of a twenty-seven year-old fatal woman married with a rich industrial that left an old passion after a tragic accident and revives her love when they reunite seven years later. The romance is quite a comedy of errors, with the feeling of guilt of Paola and Guido affecting their love. Milano in the after war with few cars on the streets is also impressive. My vote is eight.